Posted on April 18, 2008 by D.C.
Those living in Europe and interested in netbook-style laptops, in addition to more details about the MSI Wind just released, it appears that Asus will also be rolling out their Intel Atom-based Asus Eee PC in June of 2008 as well. A representative from Asus’ UK office mentioned that an Atom-based Eee PC should be available in the UK after Computex, but before the end of June. TechRadar is skeptical of such an early date, but it wouldn’t surprise me, given that the Eee PC has become the benchmark by which others in this class are judged, and Intel would probably like to have Atom-based Eee PCs out as soon as possible. 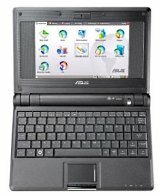 This entry was posted in Announcements, ASUS, Europe, Netbook. Bookmark the permalink.